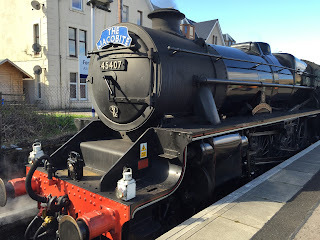 You may remember that we structured our trip around seat availability on the Jacobite steam train. Thursday was our only option, which gave us two more days in Edinburgh. Yes to the Edinburgh Castle. No to the Palace of Holyroodhouse (It was closed). But yes to the Queen's Gallery. Yes to the Royal Botanic Gardens. And yes to haggis. l love train travel, especially on European trains. And ScotRail did not disappoint--neither on the short runs between Edinburgh and Glasgow--about an hour--nor the nearly four hour trip between Glasgow and Fort William. We traveled on two outstanding, world-class rail journeys. First, the West Highland Line. 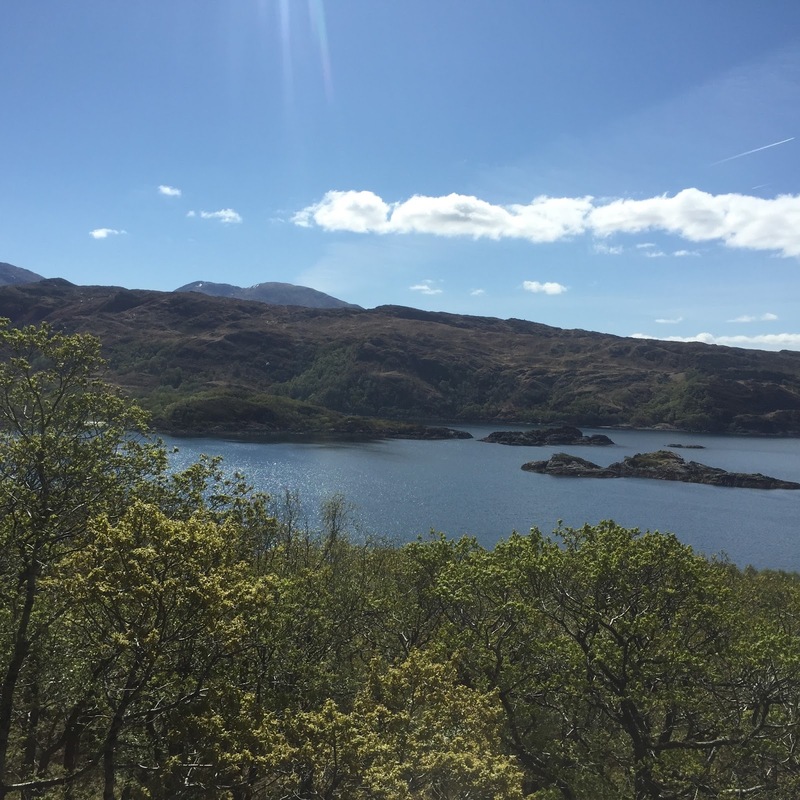 Consistently voted one of the great railway journeys of the world, it travels north to Oban and Maillaig. The train divides at Crianlarich, where part of the coaches go west to Oban and the others continue north to Fort William--our destination--and to its end point, Maillaig. 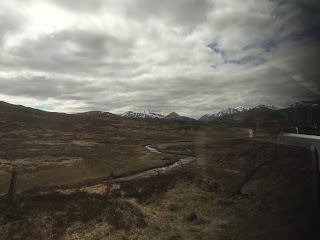 As the train's wheels clickety-clacked over the jointed rail tracks, we drank in the spectacular scenery and marveled at the engineering feat of laying the rail lines across this isolated section of Scotland. After the gigantic horseshoe curve (the builders lacked funds to build a viaduct), the train travels across Rannoch Moor where the rails 'float' across a peat bog. I felt as if I were traveling across a bridge, as, in a sense, we were. The moor is bleak and Corrrour railway station, one of the most remote stations in the U.K. Inaccessible by public roads, it is a popular starting point for hill-walkers on the West Highland Way and for Munro-baggers. The Jacobite steam train operates in summer from Fort William north to the small port town of Maillag, a distance of 41 miles and a trip of spectacular beauty. 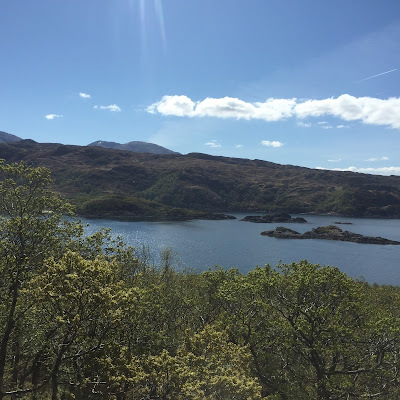 Named one of the great railway journeys of the world, the trip begins near Ben Nevis, Britain's highest mountain, and passes both freshwater and sea lochs--Loch Moror and Loch Nevis--to the small fishing and ferry town of Maillaig. The day was spectacular, as well. No rain! No clouds! And warm! And we had champagne. 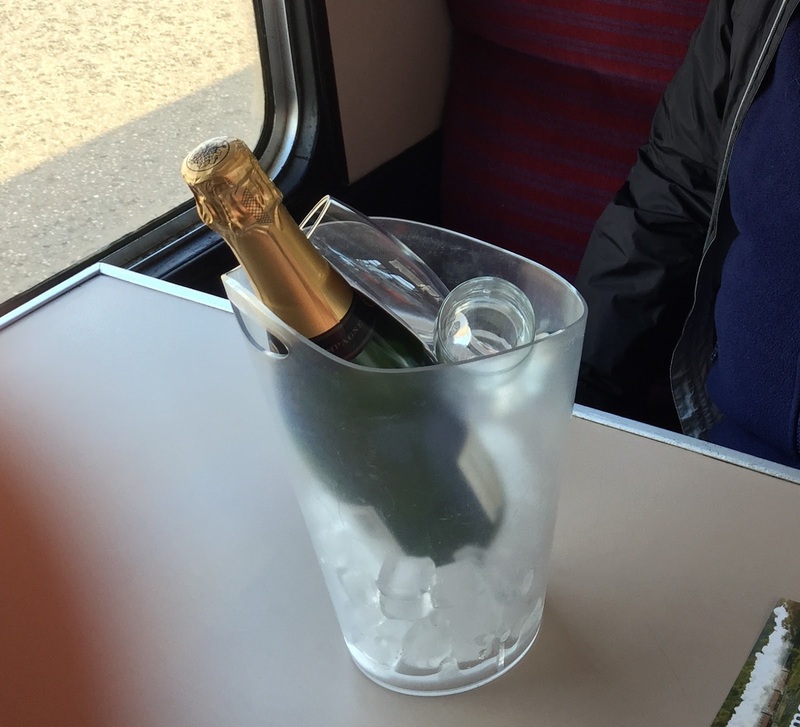 The week before, when we hurriedly booked the train, we were feeling a bit sorry for ourselves due to the last minute change of plans, so we ordered champagne for the trip. It was waiting at our seats when we arrived. Lovely. 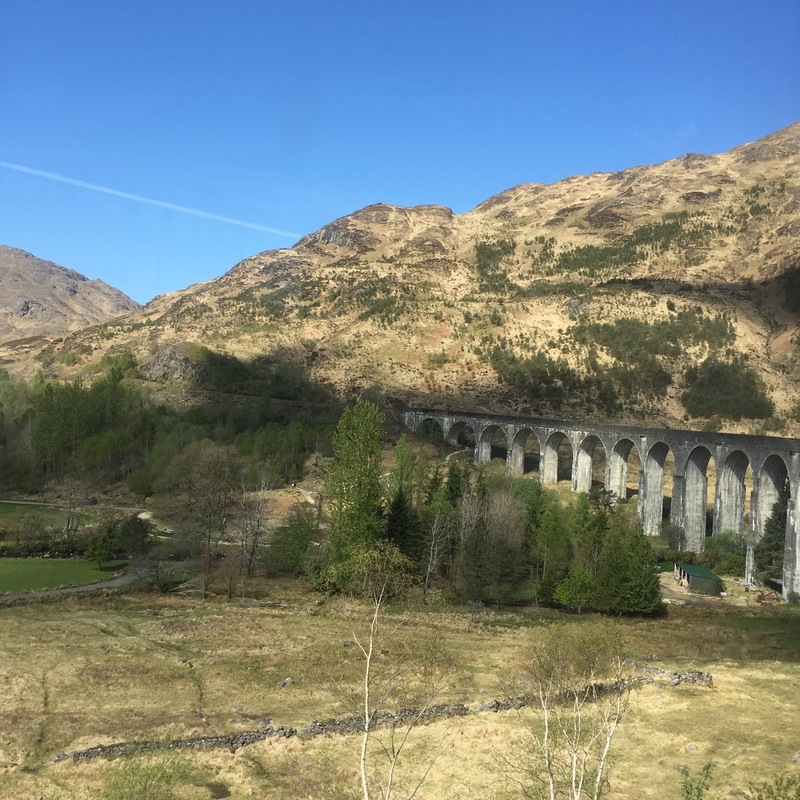 Harry Potter fans will know that the Jacobite's owner/operator provided the train used as the Hogwarts Express as well as the route for the Harry Potter movies. 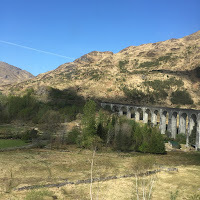 We had fans in our coach on the return trip and when the train crossed the Glenfinnan Viaduct near Loch Shiel, they jumped up out of their seats to sing, "We're crossing over the bridge." What fun! It's easy to be sentimental about steam trains, but the return journey was a reminder that they are exceedingly dirty beasts. As the day was warm, the upper windows were open. Soot and small bits of coal soon followed.